Three of the 5 planets are easy to see. Two aren’t so easy. Charts and info here that can help you see all 5 planets together in early August 2016. 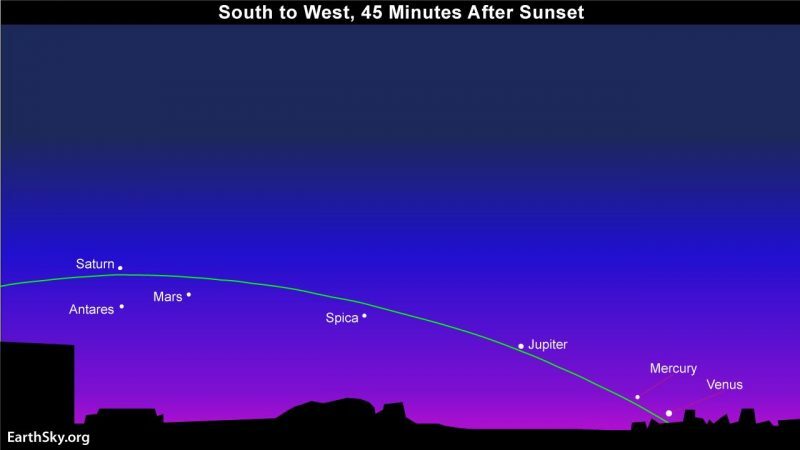 In late July and early August 2016, look from the sunset direction eastward to catch all 5 bright planets after sunset. Green line depicts the ecliptic, or sun’s path across the sky. Look for the planets along the sun’s path. You have a chance to see all five bright planets – the planets observed by our ancestors since time immemorial – together shortly after sunset in late July and the first few weeks of August 2016. In their order outward from the sun, these bright worlds are Mercury, Venus, (Earth), Mars, Jupiter and Saturn. The alignment of the planetary parade – as seen from west to east across our sky, from all points on Earth – is as follows: Venus, Mercury, Jupiter, Mars and Saturn. Let the moon help you find the planets. 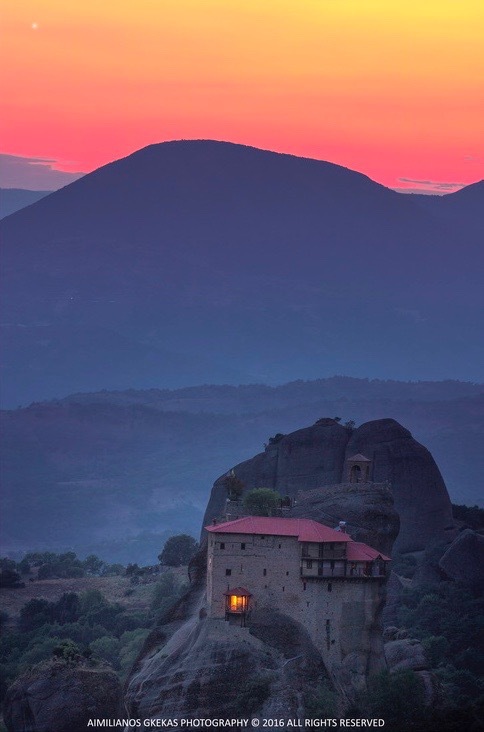 Aimilianos Gkekas caught Venus on July 26, 2016 over one of the Meteora-monesteries in Kalampaka, Greece. Notice the bright twilight background. Thank you, Aimilianos! Three planets near the sunset. You’ll need an unobstructed western horizon to see Mercury and Venus. Jupiter is higher in the western twilight. Look toward west some 45 minutes (or sooner) after sunset. Depending on your latitude, Jupiter may be the first (and only) planet visible to you with the unaided eye at dusk. If you have binoculars, bring them, and sweep along the horizon for Venus and Mercury. All of these planets are bright, however. Venus especially can withstand a fair amount of bright twilight. Give it a shot! Note: As you go southward on Earth’s globe – say, the latitude of the southern U.S. and farther south – Venus and Mercury become easier to see. 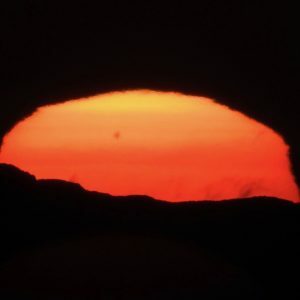 From mid-northern latitudes, Venus and Mercury follow the sun below the horizon before true darkness falls all through July and August, 2016. From the Southern Hemisphere, they stay out after dark for the next few weeks and should be fairly easy to catch with the eye alone. Click here for sky almanac recommendations. An almanac can provide you with the setting times of the planets in your sky. Or download some free planetarium software such as Stellarium, and set it for your exact location on the globe. 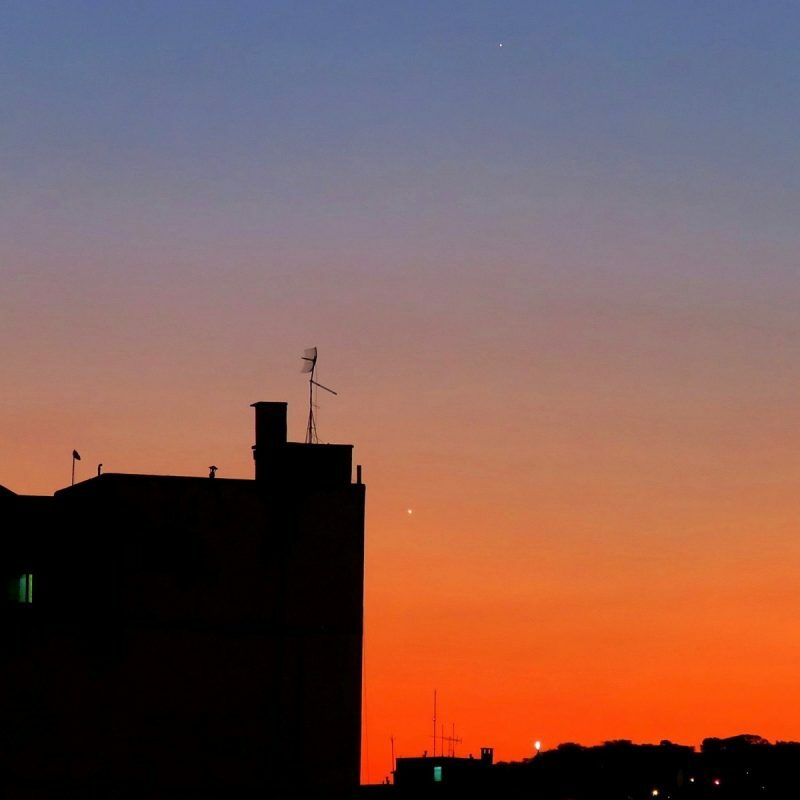 Helio C. Vital in Rio de Janeiro, Brazil caught both Venus and Mercury on July 23. Venus is brighter, to the right of the building. Mercury is at the top of the frame. Thanks, Helio. The bright one in this photo is Mars, and the 2 fainter objects are Saturn (above) and Antares (below). Notice the triangle made by these 3 bright objects on the sky’s dome. 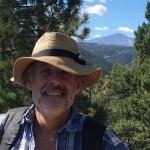 Photo by our friend Tom Wildoner at LeisurelyScientist.com. Two planets stay out until late night. 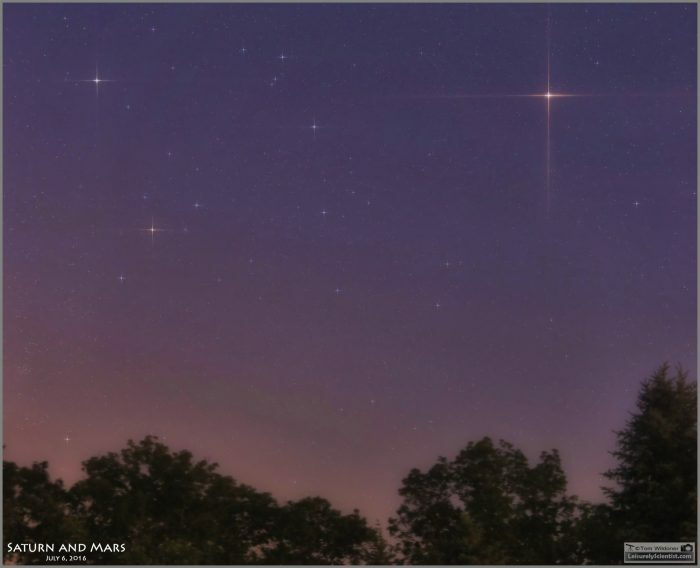 From across Earth’s globe, look for Mars and Saturn to form a triangle with the ruddy star Antares (brightest star in Scorpius the Scorpion). If you’re in the Northern Hemisphere, look southward at nightfall. If you’re in the Southern Hemisphere, look high overhead at nightfall and early evening. Mars is the brightest of these three, Saturn second-brightest and Antares third-brightest. All three are respectably bright, making this colorful triangle of lights stand out in a dark sky. Mars and Saturn stay out until very late evening at mid-northern latitudes, and past midnight in the Southern Hemisphere. Again, click here for recommended almanacs or download free planetarium software to know when these planets set in your sky. View larger. | Here’s how the moon looked earlier this summer (June 18, 2016) near Saturn, Mars, Antares and some fainter stars in Scorpius, via our friend Patrick Casaert of La Lune The Moon on Facebook. Let the moon help you find the planets. 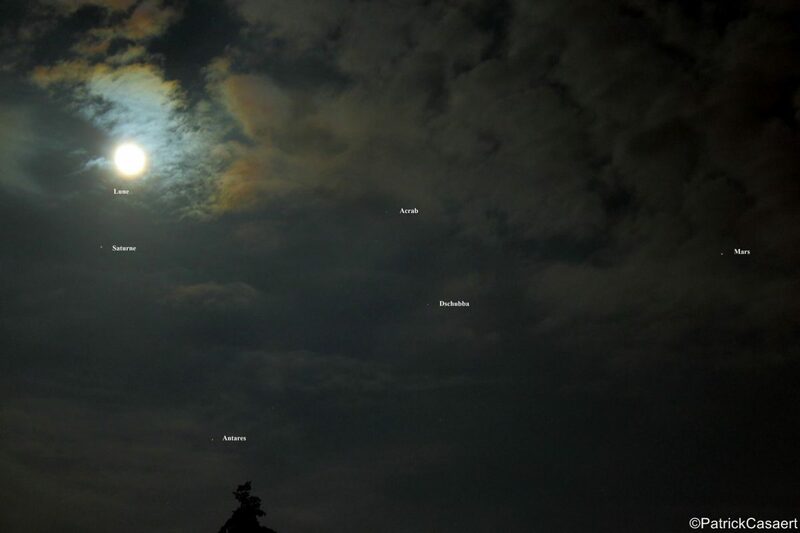 The moon is new on August 2 at 20:45 UTC (translate to your time zone). It’s very much a long shot, but you might catch the whisker-thin waxing crescent moon near Venus the following evening, August 3. Binoculars will come in handy, especially for those at more northerly latitudes. Then try for the moon near Mercury on August 4. Look for the moon near Jupiter on or around August 5. By the time the Perseid meteor shower is in full swing, on the peak night of August 11-12 (night of an expected meteor outburst), the moon will be close to the planets Mars and Saturn. 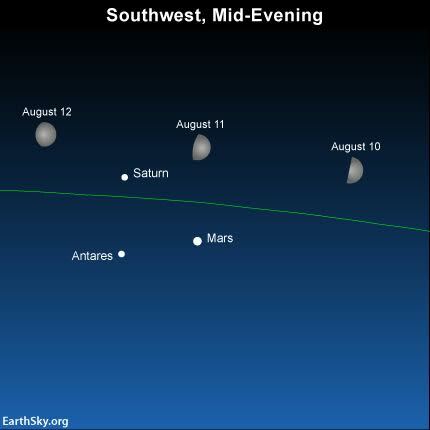 Watch for the moon to sweep up past the planets in the west after sunset, August 3-5, 2016. Waxing moon near Mars and Saturn on or around August 11, 2016. Read more. On all of these charts, the green line depicts the ecliptic – the sun’s yearly path and the moon’s monthly path in front of the constellations of the zodiac. Look for the planets along the sun’s path. Bottom line: You can see all five bright planets together at nightfall in late July and early August, 2016. 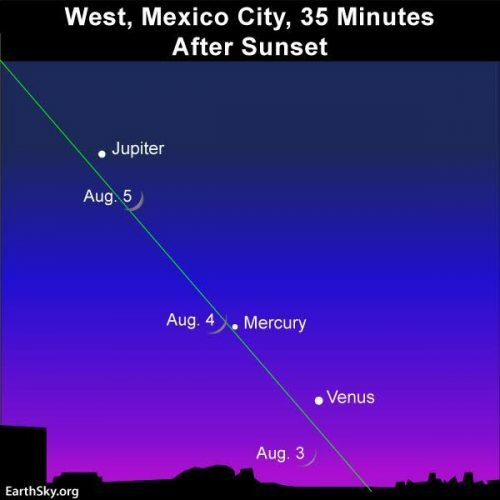 Look for the planets Jupiter, Mercury and Venus low in the west as dusk ebbs into darkness. Look for Mars and Saturn in the south (or, from southerly latitudes, high overhead) at nightfall and early evening.